The Lens Explained: What Is a Piezo Drive? Talking to a typical camera geek can be like trying to communicate with someone in a secret code. Sure, you understand "say cheese" and "smile for the birdie," but when you're on the hunt for new camera gear, you need to be able speak their language. That's why Gizmodo has teamed up with Tamron to bring you The Lens Explained, a series that breaks down everything you need to know about camera lenses. Last time we examined the differences between telephoto and wide-angle lenses. Today's post explains a key element of Tamron technology—the Piezo Drive. 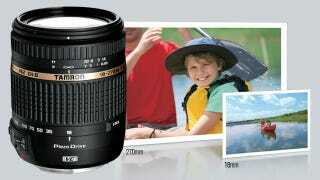 The Tamron Piezo Drive is what gives the Tamron 18-270mm lens its signature autofocus abilities. Fast, silent, and precise, the Piezo Drive functions because of a basic physics principle known as the standing wave (it's essentially a wave that, instead of propagating, stays in one place). The Piezo Drive's standing wave ultrasonic motor utilizes high-frequency voltage to extend and turn an electrically charged element called piezoceramic. Piezoceramic is material that exhibits piezoelectric properties (which is basically a charge that accumulates in specific materials, like piezocermanics). The piezoceramic inside of the Piezo Drive has a metal tip that moves in an elliptical pattern that propels the drive's rotor by means of friction. The advantage of the drive's standing wave ultrasonic motor is that it's significantly smaller than most lens motors—making for a much more compact lens. Not terribly painful, right? And now you'll be able to understand this next part: the Tamron 18-270mm lens is a super powerful, all-in-one 15X zoom lens. It's made for use with Canon, Nikon, and Sony APS-C size DSLR cameras, and has won two major awards: the EISA Best Product 2011-2012 and the Japan Camera Grand Prix 2011. Weighing just 15.9 ounces and measuring 3.8 inches in length, the impressively compact lens features Vibration Compensation (Tamron's proprietary image stabilization) and a Piezo Drive. Head here now for a closer look at all of the features of the Tamron 18-270mm lens, and don't forget to check back on Thursday for the final installment of The Lens Explained.